For offers and bead news join my mailing list! FREE SHIPPING on UK orders of £25 + ! Use our shipping estimator to see exact international shipping costs. Order before 11am for same day despatch! Cernit Polymer Clay & Supplies - Bulk Deals Now Available! EJR Beads stocks Cernit professional quality polymer clay at well below the RRP! We carry the full range of 56g packs with many colour available in larger 250g and 500g. For you serious users, check out our bulk deals on 500g blocks, even better value still! We restock frequently, so you can be sure of the freshest clay - don't see what you need? Ask - we can probably get it in for you. We've extended our range of Niobium and Titanium findings to include two great new colours - Ice Blue and Yellow. If you make jewellery to sell, especially using statement art beads, these findings are what you've been waiting for. Our Niobium and Titanium findings never tarnish, are great quality and are truly hypo-allergenic. We have earwires in natural colours to team with silver and copper beads and findings, or brightly anodized findings in a range of vivid colours - perfect for teaming with brightly coloured polymer or glass beads. We've even got anodized niobium wire so you can make your own findings! 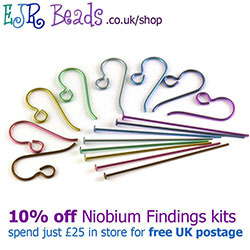 You can buy our colourful niobium findings by the pair or in kits with all the colours. We also stock a range of 5 pair packs in one colour options or a variety of themed colour collections. So there will be a kit to suit you, whatever your budget and whatever jewellery you are creating. New in - the most sumptious shipment ever of our Baltic Amber chip beads. Our amber beads are imported direct from the Baltic region, so you can be sure of the best quality, genuine European amber. The beads are heat-treated to bring out a range of natural colours, from palest butterscotch and lemon yellow to a deep, almost black, cherry red. You'll love the range - but if you can't choose, why not pick up a strand of our mixed chips. 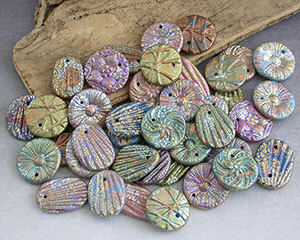 Visit the Emma's Art Beads section to see what's new. All my lampwork glass beads are handmade by me, kiln annealed for durability and cleaned. Perfect for your next jewellery creation. 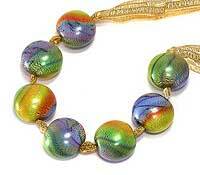 Remember - for jewellery that looks different, you'll need beads that are different. I've been working on some new ceramic art beads lately. You'll find the first offerings up for sale now, but do keep coming back as there's more to come over the next few weeks! As always, my art beads are one-off sets, sold on a first come, first served basis. So if you see something you like - grab 'em while you can! Learn to Make My Polymer Clay Art Beads! Now Available for Immediate Download. Illuminare & Clarice Beads - Polymer Clay Tutorial! In my first downloadable e-book, I share all my secrets on how to make both of my signature styles of polymer clay bead. You will learn how to make both these sets of beads, step-by-step in ludicrous detail - over 90 colour photographs, 45 pages with detailed instructions throughout. I also cover how to shape your beads and get the perfect, flawless finish. Plus how I create distortion-free lentil beads. You'll love these polymer clay tutorials, whether you are a clayer and want to try out the techniques, or a collector who would like to know a little more about how the beads in your collection came to be. Please read our Ordering Information pages for full details on store policies before placing your order. Thank you!